It’s hard to believe it has been 4 years since I’ve been on this recovery journey! It’s amazing when I think about where I was 4 years ago. I had found out a few years earlier that both my birth parents were alcoholics, and drinking alcohol was something I did for an entire lifetime. WHY? The pain of the realities of my adoption were just too great. I couldn’t handle them. I couldn’t process them. The pain from my childhood growing up and earlier years in life, were huge and alcohol seemed to be the only thing available to ease the heartache. Due to this lifestyle I attribute it to many other things that happened as a result of MY CHOICES! I could sit and play the blame game here, but I learned real quick in recovery I have to take responsibility for my actions, choices, etc. I have done that. I don’t blame anyone for my choices. Back on Aug 13, 2013 it was not only my birthday but it was the day I decided to throw in the towel on my drinking habit. I was scared, all alone and pretty frightened on how I was going to do this. I was praying and God kept giving me the word “MULTIPLY MULTIPLY MULTIPLY“. What did this mean? He told me he was going to remove all the toxic people, relationships and things that weren’t his plan for my life, but if I just held onto HOPE- HIS HOPE he was going to multiply my life in every area possible. Friends, Finances, Spiritually, Emotionally, Etc. It seemed I was about to transition from an OLD LIFE to a NEW LIFE. The NEW LIFE GOD had planned for me All along. No one told me I was about to grieve the loss of the old life. I figured this out on my own. Old ways, old habits, old friends, and all the things that were familiar to me for the first 37 years of life! I continued to go to church and I started attending the most amazing ministry ever, Celebrate Recovery. This ministry is not for sissies! I always say adoptees aren’t sissies, we are some of the strongest people on the planet! We couldn’t handle this journey if we weren’t strong! ALL OF US, even if you don’t feel that way! Over the last 4 years I have grieved my losses regarding my adoption experience. I have cried, I have been sad, I have been depressed, I have been heartbroken, I have been filled with hopelessness, fear and unbelief. I have gone through just about every emotion and feeling known to man regarding this journey, and my hopes in going THROUGH IT IS SO I WOULD HEAL IT! God knows my purpose in sharing my pain is to offer HOPE to someone else, another adoptee out there who might be feeling this way. I have always kept God in my life, sharing where he is who has given me hope and strength. I am certain without my relationship with God I wouldn’t even be alive today! He gets the glory! As 4 years have passed, I have gone all the way back to my childhood, pulled out ever skeleton in my closet, and with the tools from Celebrate Recovery I have set those things on the table, identified my root issues, and asked God to come into my life and do a mighty work on me. Abandonment & Rejection from adoption are the ROOT of my issues. With these issues being so deep rooted, I have found to have triggers all over. I am in therapy now to work on triggers. I have to do what is best for me so I can be a happier healthier mother for my kids, and be of more support for my fellow adoptees, and so I can be a better friend, sister, and person. I have had to make these choices for myself as well as the choice to move forward out of all the darkness the enemy has held me captive in for far too long! We all have this choice! During the last 4 years, I was not able to celebrate a birthday. 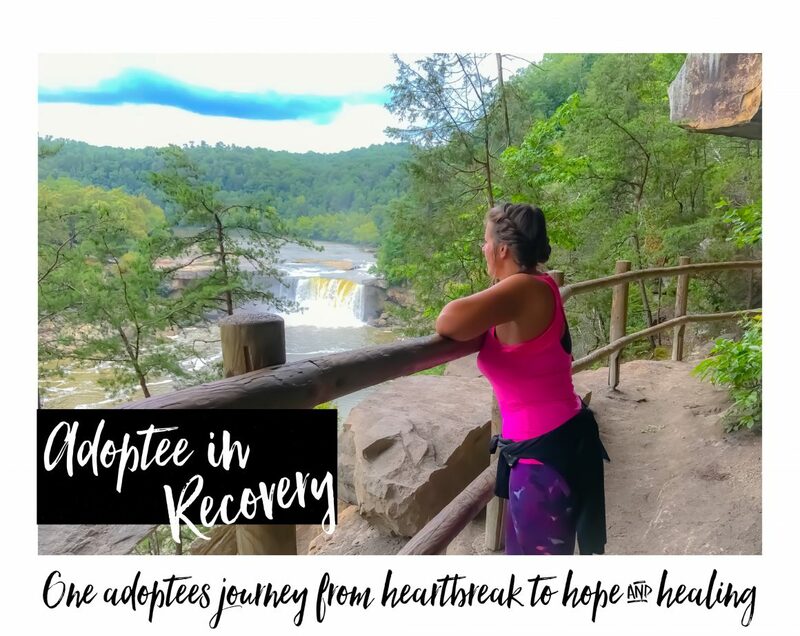 When I was not in recovery it was easy, I drank to drown out the realities of what happened that day. It was simple. I wasn’t present. I was out of my mind. The last 4 years as my birthday approaches it’s been like dooms day, terrible and its impossible for me to describe it to non-adoptees. Most of my fellow adoptees get it. The visions I have of that day are gloomy, sad, and dark. It’s the day I lost my biological mother and family. It’s never a happy day to me, only sad. Deep dark sadness. BUT THE REST OF MY LIFE DOES NOT HAVE TO BE LIKE THAT! ONLY IF I CHOOSE FOR IT TO BE! Every single person on this planet has a choice. We can sit and wallow in the pain, or we can move through the pain and get to the other side of healing and true freedom. This is the same healing and freedom God has for all his children. YES I AM TALKING TO YOU! Yes, it’s important we feel the pain, because we have to feel it to heal it. I have spend the last 4 years feeling it and healing it. You can tell by my blog, the roller coaster of emotions, experiences, feelings that have followed me through this journey. I feel it’s this place has been a huge factor to my healing! A space all mine to share my heart. So for the first time in 4 years I planned a birthday dinner. Who did I invite? All the people I hold very close to my heart. The people God promised me he was going to MULTIPLY my life with, happier, healthier, amazing friends that I call family. A few old relationships, but mostly new. My amazing kids, and I can’t even express to you how excited and happy I am that God has put some amazing people in my life! He did what he said he was going to do, He MULTIPLIED! He’s still multiplying! I had a step study sister say one time, “I try to remember God is who he says he is, He’s going to do what he said he’s going to do and I am who he says I am!”. Talk about POWERFUL! I try to remind myself of this daily and I want to ask you to remind yourself of this daily! We aren’t what we were born into. We aren’t what the world says we are. We aren’t what past relationships have said about us. WE ARE WHO GOD SAYS WE ARE! That should put a smile on your face. I learned in the last 4 year I am not like my birth family, I am not like my adoptive family. NOT EVEN A LITTLE BIT. The day before my birthday my adoptive cousin sent me a link to a song. I truly believe God was behind this because I don’t think my cousin even knew it was my birthday and she didn’t know the feelings I was having regarding my birth father, him not responding to my letters after I sent Him DNA proof I was His only daughter. I was feeling all kinds of ways, but behind it all God has given me a peace about it I have never had. The night before my birthday I played this song over and over but I applied “Mother and Father” to it and “All People Are Broken”…. I really want to ask you to take a moment and listen because as I laid in my bed and allowed myself the room to cry and go through the emotions the day before my birthday it left me with a space to grieve once again my losses that adoption has brought. I needed this for myself so I could put on a TRUE smiling face for my birthday and actually enjoy the people God has blessed me with! Please listen to this song! It has changed some things for me and allowed me to look at things from a different perspective. It’s allowed me to have a compassion for my birth parents and adoptive parents I never had before. I hope it can do the same for you! Here are some pictures from my birthday celebration. Sending much love to my amazing kids, my friends and those who came to hang out with me and support me! The letters you all wrote touched my heart and the photos we took I will cherish forever! I am so blessed and thankful to have some amazing people in my life! GOD DID IT! HE MULTIPLIED! I’m so thankful! I’m excited to see what the next chapter is! God knows my heart and he knows my passion for helping hurting adoptees! I’m praying he use me to share his love with each of them. I had to experience this life to be able to have this passion. It’s God’s plan for my life to use my pain for His Glory! He has this plan for all of us! To my fellow adoptees who might be reading, God knows your tears, your pain and your heart! He says in His word he can and he will heal it! We have to allow ourselves the space to FEEL IT! Please know you are not on this journey alone and I am here for you if you need me! Find a safe place to share your feelings, start a blog, share your story! REACH OUT TO ME! I have a message of HOPE FOR YOU! God is HOPE! He is TRUTH! He is LOVE! I love you all! Blessings! Here are some of my birthday photos!